With over 100 years of experience making bicycles, Schwinn is an industry-standard company that has rode around the block a few times. Since starting a health and fitness division focusing on workout equipment in 1966, they are an industry leader in that arena as well. 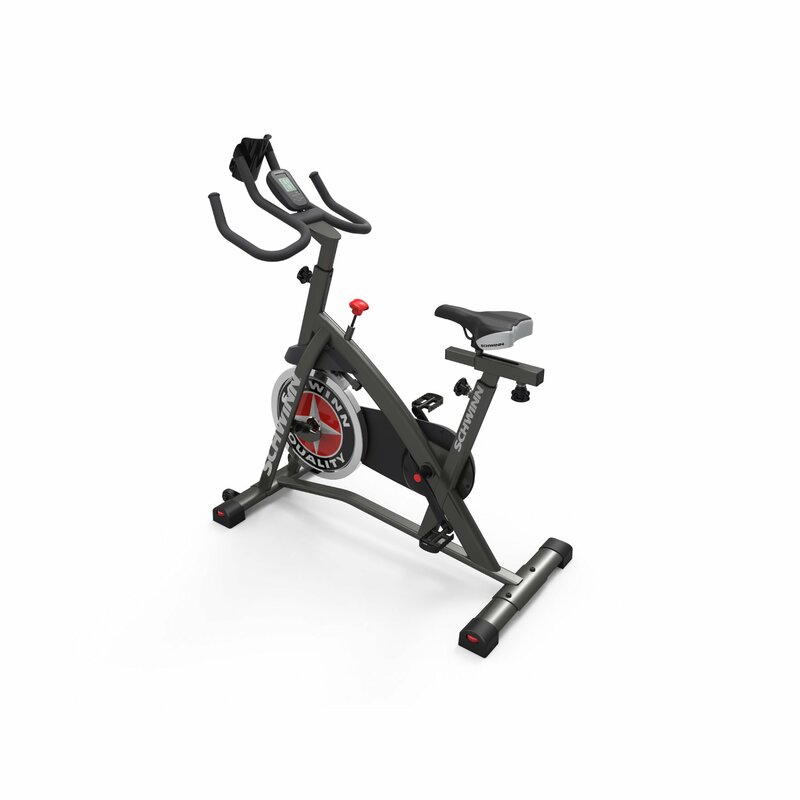 The culmination of both can be found in the Schwinn IC2 Indoor Cycling Exercise Bike. The IC2 is the perfect home exercise bike made of quality components and all the bells and whistles you need to truly catch the experience of a real hard-pedaling bike, all from the comfort of your own home. The bike can be adjusted easily to accommodate riders of various sizes, and the high-inertia direct drive gearing system can adjust levels of resistance for riders in consistent increments to simulate steeper terrain. All that and more at a price of $367.44 for the 2011-released IC2 from Schwinn. Easily adjustable pedals and outdoor riding inspired Q-Factor, including handlebars with multi positional functionality and a seat with fore/aft positions. Integrated MP3/ bottle holder and fan. The sturdiness of the design is really a strong selling point. With some upright bikes you have to augment your natural riding style to accommodate the flimsiness of the design, but not with the IC2. The stabilizers do their job and keep the rider from experiencing a “speed wobble” effect, or a rocking back and forth that often happens with less sturdy models. Also, being able to strain while torquing up a hill is a relief after trying other upright bikes that are made with smaller flywheels. With the Schwinn IC2, feel free to crank the resistance up until it becomes nearly impossible to move! Another serious benefit is the oversized saddle. Anyone who has spent hours on a bike knows where comfort is most important: the saddle and the handlebars.This model keeps you riding in comfort for miles after other saddles have you sidelined waiting for a replacement. The handlebars aren’t too shabby either, and the exercise bike gives a rider enough of a range where they can find the best customized fit that will suit their riding style and keep blisters off of their hands and, ahem…other areas. Another important comfort option is the Q-Factor, which is the distance measured between the pedals and where they attach to the cranks. The IC2’s Q-Factor closely matches the way people walk, making it much more comfortable and ergonomically superior to other exercise bikes. Some upright exercise bikes have small displays with numerous small buttons, making it difficult to find the data the rider seeks. With the IC2, the streamlined LCD display keeps the rider in control and well informed with large, easy to read numbers and only one button that controls resetting the trip. One of the best parts for me is the convenience of the wheels. The bike’s wheels and weight enable the rider to move the bike without using too much of the energy recently burned on a long ride. Being 83-pounds and easy to use, while maintaining a sturdy design, puts the Schwinn IC2 above comparable models in its price range. It would be nice if the electrical warranty of one year were a bit longer. It wouldn’t matter if the bike’s frame were still sturdy if a rider loses access to the vital information the LCD display shows on the screen. Also, not a big fan of the toe straps, the material used seems a bit lackluster compared to the rest of the materials used on and for the construction of the exercise bike. Also, in the case of actually needing a repair within the first 90 days, a rider must hope and pray they live in a metropolitan area where Schwinn will send a technician for free. Otherwise, the repairs will come out of the rider’s own pocket. Some of these are picky things on an otherwise sturdy, competitively priced option for exercise bikes. Based on the strong frame materials, the amount of resistance that’s offered by the large flywheel, and the simplicity of the LCD display, this bike gets gold stars and a positive review. I would not worry about the small nitpicky things covered above; the good definitely outweighs the bad when it comes to the Schwinn IC2. In this price range you just don’t see all of these quality features in one bike. This machine is comparable to an exercise bike much more expensive, such as the Bladez Fitness TheMaster PTS68 Exercise Bike at a cost of $699 on Amazon. The combination of solid components and fire sale pricing has the IC2 at the top of many lists as the best bang for your buck upright exercise cycle on the market.